Let’s kick off this body composition tell-all with the “gold standard” method. DXA, which stands for Dual-energy X-ray absorptiometry (say that three times fast! ), uses a tiny dose of ionizing radiation to produce pictures of your body. Using those pictures — and our knowledge of the different properties of bone, lean tissue, and fat tissue — DXA tries to differentiate the “good stuff” (bone, muscle, ligaments, and the like) from the “bad stuff” (fat). The nice thing about DXA is that it can directly measure the amount and density of bone in your body, known as Bone Mineral Content (BMC). BMC is helpful for the early detection and diagnosis of bone diseases like osteoporosis and osteoarthritis. Because DXA directly measures bone, it can break the body down into the three "compartments": bone, fat, and lean mass, thereby providing richer information about body composition. Hence, DXA is referred to as a three compartment model. Although DXA is a 'tried' method, it’s not always necessarily 'true'. From a practical perspective, different manufacturers or models of scanners, as well as analysis methods, can yield drastically different values for bone mineral density, which in turn affects the ability to accurately estimate body fat. From a scientific perspective, regions of tissue directly adjacent to bone are not directly measured, but rather inferred from other non-bone body regions. Since nearly 50% of the pixels contain both bone and tissue, almost half of your body’s tissue composition is inferred. Even changes in hydration level have the potential to impact measurements within the same individual. Taking a slightly wider lens, a number of rigorous peer-reviewed research studies have found that DXA tends to underestimate belly fat. This underestimation worsens with increased obesity – so the larger the person, the more inaccurate their measure of belly fat. 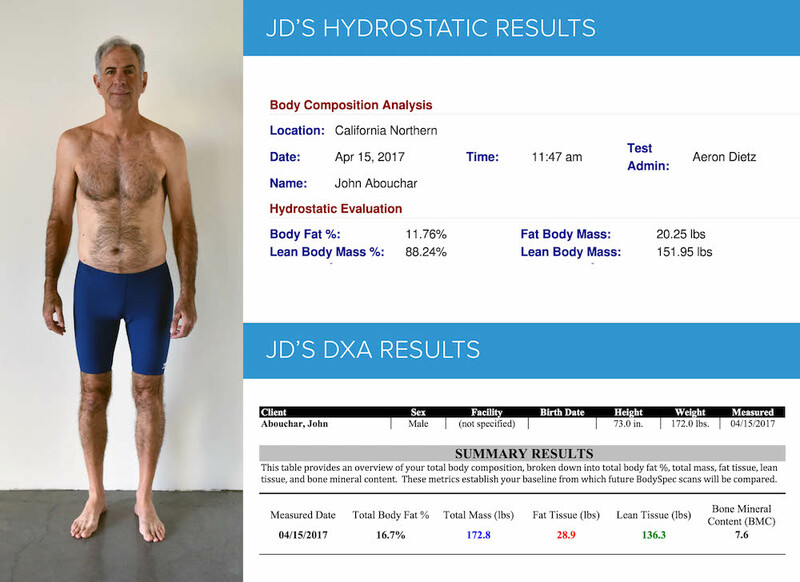 The opposite is also sometimes true, as there are documented cases of gross overestimation of body fat in very tall, very lean, or very athletic individuals, as we witnessed with our Ironman beta tester, JD (refer to the introductory post in this series for more DXA results from our beta testers). DXA is an excellent method for measuring bone density, which can be critical in-and-of itself. DXA is also a great method for capturing general trends in body composition over time. It's also the best we've got short of a full-body MRI (which is both expensive and often inaccessible!). It’s a painless, quick, and easy way to learn more about where you distribute weight – both muscle and fat alike. The average DXA scan is around $125, so if you’re looking for regular scans, it’ll cost you a pretty penny. It’s also not as reliable or valid as many articles would lead you to believe – in an average individual, DXA's body fat reading may be off by +/-1.5-2%, but it may be off by as much as 7% in some cases. DXA is a safe bet. It’s not perfect, but short of dissection, it’s one of the best methods we have. For best use, get your DXA results alongside another accepted method, like a dunk tank or a Bod Pod (or a Naked scan!). Together, you’ll get a pretty good picture of where you are now and where you should be heading.